NanoEngineering meets chemical engineering meets electrical engineering for Lindsay Freeman, a graduate student at the University of California San Diego’s Jacobs School of Engineering. Freeman is getting a Ph.D. in chemical engineering, her home department is NanoEngineering, and she is doing her research in an electrical engineering lab. Freeman presented a poster on the fusion between optical physics and chemistry at Research Expo on Thursday, April 14 (see abstract below and see all poster abstracts here). Freeman, from South Carolina, knew she wanted to be an engineer. As a child, she loved to build computers, and pursued computer engineering as a result. However, she shifted away from it when she realized she really liked chemistry. Freeman plans to complete a postdoc at UC San Diego before pursuing other job opportunities in the area. See the best poster award winners here. Want to meet more than 200 graduate students doing innovative engineering research, like Freeman? Don’t miss Research Expo in 2017! Plasmonic devices are of great interest due to their ability to confine light to the nanoscale level and dramatically increase the intensity of the electromagnetic field, functioning as high performance platforms for Raman signal enhancement. While Raman spectroscopy has been proposed as a tool to identify the preferential binding sites and adsorption configurations of molecules to nanoparticles, the results have been limited by the assumption that a single binding site is responsible for molecular adsorption. Here, we develop the simulated Raman correlation spectroscopy (SRCS) process to determine which binding sites of a molecule preferentially bind to a plasmonic material and in what capacity. We apply the method to the case of nucleic acids binding to silver, discovering that multiple atoms are responsible for adsorption kinetics. This method can be applied to future systems, such as to study the molecular orientation of adsorbates to films or protein conformation upon adsorption. Search all poster abstracts here. Stay tuned for more photos from Research Expo 2016! 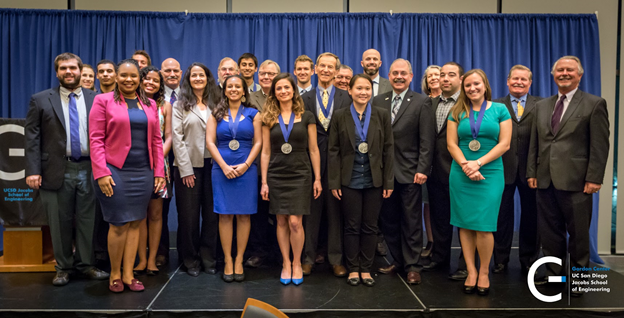 Gordon Scholar students, alumni and industry professionals, UC San Diego faculty and staff filled the Great Hall on March 9, 2016 to recognize the awardees of the annual Gordon Engineering Leadership Awards. 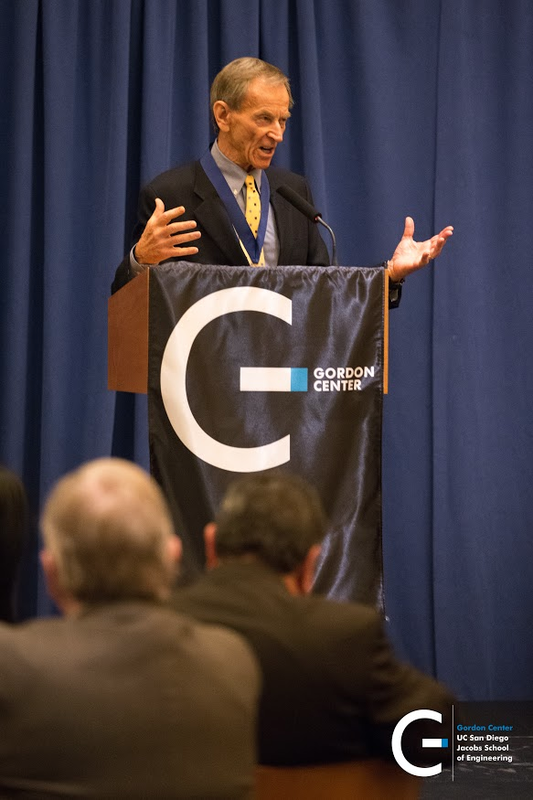 “You all are at the right place at the right time, the combination of information and energy... [creates] unlimited potential for the world,” Linden Blue, the co-owner and vice chairman of General Atomics, speaks to the room after accepting the Professional Gordon Engineering Leadership Award. Dean Albert P. Pisano introduced Blue, recognizing him for his inspirational engineering leadership and technical contribution to aviation and energy. 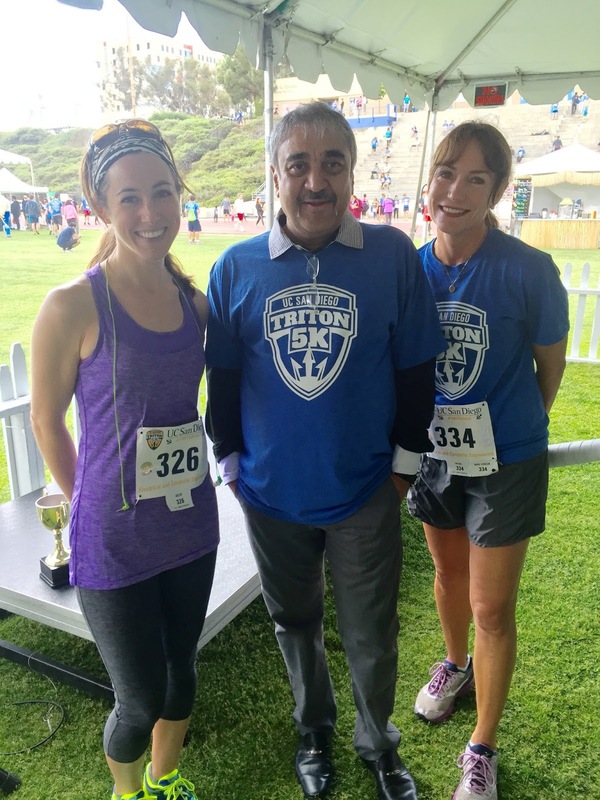 Blue is the epitome of an engineering leader; possessing technical innovation, engineering excellence, and corporate leadership, Blue is credited for building one of San Diego’s most prestigious engineering companies - General Atomics. The company is one of the world's leading resources for high-technology systems, including nuclear fuel systems, remotely operated surveillance aircraft, airborne sensors, and advanced electronic, wireless and laser technologies. Aside from helping oversee a diverse technology portfolio, Blue is currently working to develop the Energy Multiplier Module, EM2, which is a small nuclear power generator that converts spent nuclear fuel into energy. Bloomberg News recently called EM2 one of the top 8 methods to saving the planet. The awards were presented to the undergraduate and graduate students by Gordon Center board members Rusty Sailors, CTO/President of LP3, Carmela Keeney, Executive Director of SPAWAR and Dr. Ebonee Williams, Executive Director of Gordon Center. The Gordon Center’s annual Engineering Leadership Awards recognizes outstanding student, industrial/government/military and academic leaders who have demonstrated excellence in leadership, engineering ability, communication skills and teamwork. In addition to undergraduate and graduate opportunities, the California State Summer School for Mathematics and Science (COSMOS) provides high school students the opportunity to explore and work on engineering projects in a four-week summer program. The best teams are awarded engineering leadership awards by the Gordon Center in a ceremony which takes place in August. Through its Gordon Scholars Program and Engineering Leadership Awards, the Center identifies and celebrates talented individuals with leadership potential. In addition, the Center exposes students to the advice, experience and attitudes of proven engineering leaders through training events including workshops, leadership forums and summer programs. Winners receive a medal, membership in the Gordon Center Alumni Network and a monetary award. Recipients of the award are first nominated by mentors and department chairs. They are chosen through a competitive selection process by the Gordon Center Advisory Board. This year the graduate and undergraduate awards were presented to the following outstanding students for their contributions to engineering leadership. In recognition of his leadership co-directing 8 teams of undergraduate researchers and for building an alliance between the School of Engineering and the School of Medicine for medical computer vision research. In recognition of her technical contributions to the designing of nanoparticles for treating disease and for building community among graduate students. In recognition of her leadership on large-scale structural testing design and analysis and for educating the next generation of structural engineers. In recognition of her technical contribution to statistical analysis of EMG signals and to leadership of project teams. In recognition of his vision for the Institute of Electrical and Electronic Engineers (IEEE), increasing technical competition participation, and fostering engineering community through outreach. In recognition of her leadership of multidisciplinary engineering teams in Fiji and the Philippines and in her commitment to humanitarian engineering. In recognition of his leadership in multiple research teams and his commitment to the development of low-cost medical devices through UCSD’s Engineering World Health. 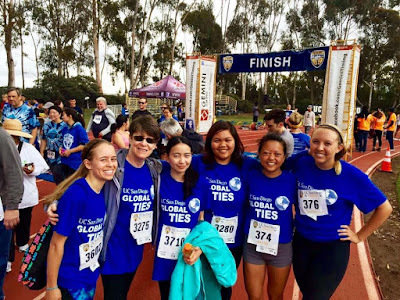 In recognition of her leadership founding UCSD's Keystone Structural Engineering and Divergent Engineering Teams and her contributions to ocular implantable sensor research. 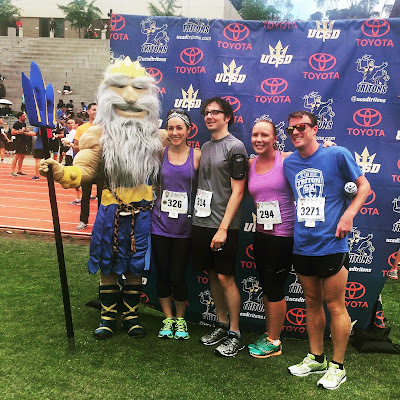 Jacobs School of Engineering students, alumni, faculty and staff achieved an elusive trifecta at this year's Triton 5K race. 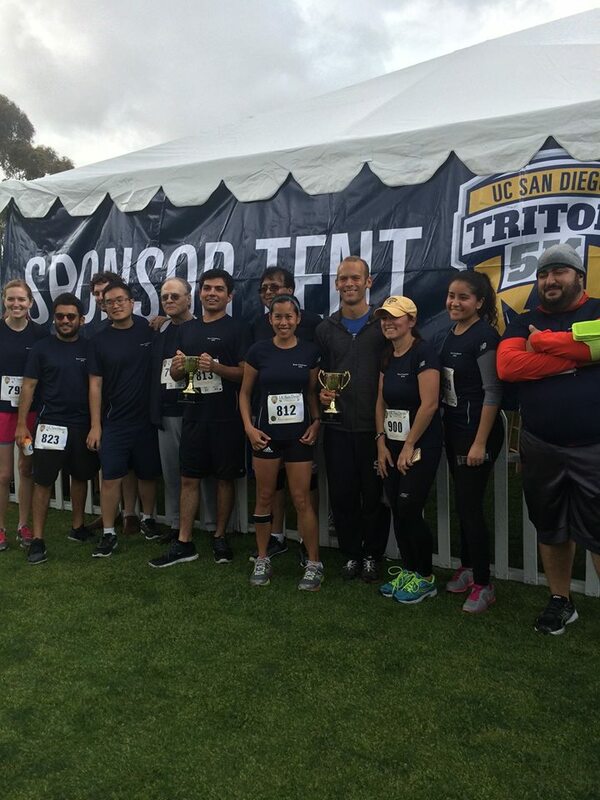 The Department of Computer Science and Engineering fielded the largest overall team--226 strong. The team also raised the most funds: $6,334. It's named Race Condition--a play on words on a computer science term that means a behavior that happens when a device or system tries to perform two or more operations at the same time, but can't because of its very nature. Some members of the team flew from as far as New York. Meanwhile, the Department of Electrical and Computer Engineering fielded the largest campus team-- 82 strong. 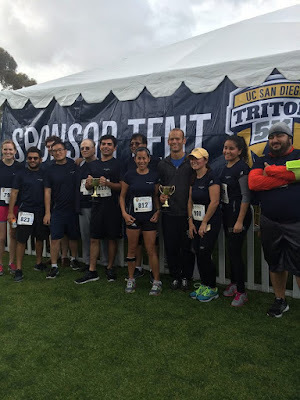 The Triton 5K raises funds for scholarships for UC San Diego students. This year, in addition to the race run on campus, teams also ran in China, Taiwan and the United Kingdom. The event is sponsored by a number of organizations and alumni. It wasn't just departments that turned out. Global TIES fielded an all-female team. Photo above: from left: Jamie Bradley Steck, alumnus of Global TIES and computer science (master's), now a lecturer for Global TIES; Global TIES Program Director Mandy Bratton; Chonlada "Pam" Woointranon a senior majoring in management science and computer science; Regina Caluya, a chemical engineering senior; Christina Aguila, chemical engineering senior and Brooke Ryan, a computer science junior. The latter four are undergraduate project advisors for Global TIES. UC San Diego is home to the world's largest outdoor shake table (or earthquake simulator) and to some serious surfing--including one of the nation's top college surfing teams and to a team that makes surfboards out of algae. So this year, students admitted to UC San Diego got a chance to surf during a simulated earthquake, all while wearing an Occulus Rift virtual reality headset. Students heard a warning that a 9.9 earthquake has taken place and a giant tsunami is nearing the shore. Near the shakeboarding experience, students from the UCSD Seismic Outreach Program allowed campus visitors to "make their own earthquakes" by jumping on a mat equipped with an accelerometer, connected to a computer that made a building made of K'Nex shake on a small shake table. 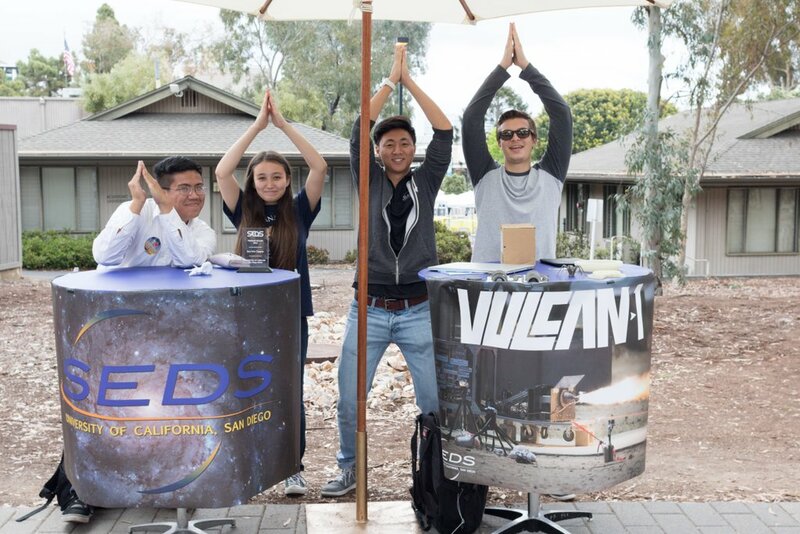 “It’s definitely not your traditional info booth,” said Armen Azizian, a structural engineering graduate student told This Week @ UC San Diego. Azizian said he enjoyed sharing the technology with admitted students one-on-one, including those who aren’t necessarily going to be engineering majors. UC San Diego Seismic Outreach teaches about seismic safety at Triton Day. On Library Walk, many of the school's student organizations had come out to get prospective students excited about everything the campus has to offer. The Triton Rocket Club showcased their robot. 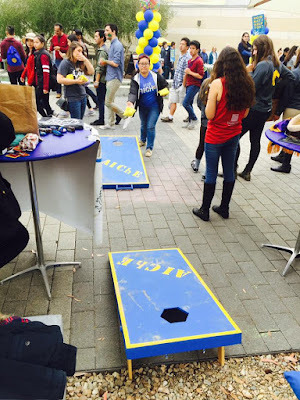 AIChE, the chemical engineering student organization had a bean bag toss game. 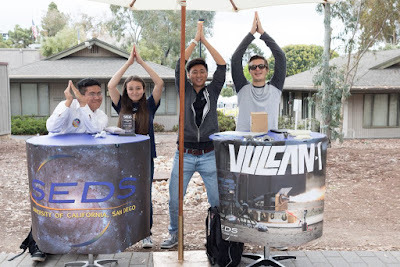 SEDS at UC San Diego talked about 3D printing a rocket engine, a unique feat. The Tau Beta Pi engineering honors society was out in force. Engineers Withouth Borders at UC San Diego talked about their projects.